Pen and paper based exam of JEE Main-2015 has been conducted by the Central Board of Secondary Education (CBSE) on April 4th, 2015. Jagran Josh has published the complete analysis of the paper in terms of difficulty, class wise analysis and subject/topic wise analysis. Pen and paper based exam of JEE Main-2015 has been conducted by the Central Board of Secondary Education (CBSE) on April 4th, 2015. Jagran Josh has published the complete analysis of the paper in terms of difficulty, class wise analysis and subject/topic wise analysis. 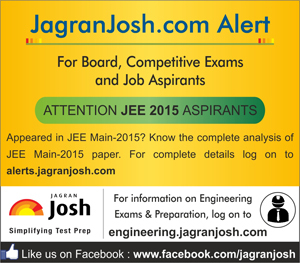 Following post contains the class wise analysis and the subject wise analysis of the JEE Main-2015 paper. The Question Paper-1 of JEE Main-2015 for B.E./B.Tech courses had multiple choice questions. Out of four one option was correct in every question with marking scheme of +4 & -1 i.e. 4 marks for right answer & 1 mark will be deducted for a wrong answer. There were 30 questions each in Physics, Chemistry & Mathematics. The paper was completely based on the CBSE syllabus of Class XI & XII. In JEE Main-2015 most of the questions are conceptual and in some questions, analytical skill was also needed to solve the questions. The maths Section of JEE Main-2015 was the easiest, followed by Chemistry and then Physics. Based on the April 4 version of the exam, JEE Main cut off is expected to be around 115 marks (out of a total of 360 marks) for General Category students this year.